Former Chelsea and England defender Graeme Le Saux came to the aid of a couple whose camper van burned to ashes minutes later. Le Saux, 46, was in Cranleigh, Surrey when he saw smoke coming from the vehicle on the side of the road. After discovering there was gas and petrol on board he asked the couple to move to safety. "It went from motor home to ashes in around 25 minutes," said Le Saux's wife Mariana, who was at the scene. "I have never seen anything go up so quickly. 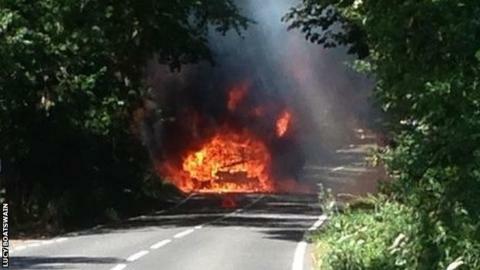 You could just see this inferno," she told getsurrey.co.uk. "We heard mini explosions, which I guess could have been the windows exploding." A 72-year-old man suffered from smoke inhalation and was treated at Royal Surrey County Hospital after Sunday's incident, though his condition was not serious. Le Saux, who lives in the area, played down his part in the incident but was thanked on social media, receiving a "well done" for his efforts from Rushmoor Fire Station. "It was more a case of getting to the other side of blaze and turning cars back than full on super heroes! Poor couple," he tweeted. In a 16-year senior career, Jersey-born Le Saux won the FA Cup with Chelsea and Premier League with Blackburn Rovers, earning 36 caps for England on the way. He also played for Southampton.